The ensemble Les Dissonances was founded in 2004, on the initiative of David Grimal, as an artists’ collective. It may seem rather strange to associate the word “dissonance” with a musical ensemble. The spirit of Les Dissonances is one of bringing together disparate worlds – there lies its specificity. 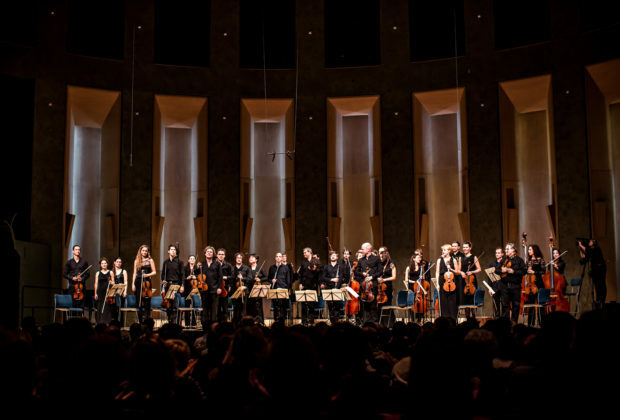 The ensemble creates a link between those involved in the various different aspects of music (composition, solo performance, orchestral music, chamber works) and it includes not only musicians from the greatest French and international orchestras, but also talented young artists who are just embarking on their careers. The ensemble Les Dissonances performs the major works of the symphonic and chamber repertoires (Strauss, Bach, Schubert, Beethoven…) as well as new works by composers of today (Thierry Escaich, Brice Pauset, Marc-André Dalbavie…). The ensemble varies in size according to the requirements of the repertoire and plays without a conductor. It has absolute freedom in its choice of programmes. Such autonomy enables the musicians to fulfil their first objective, which is to go out and meet new audiences that have tended to be intimidated by “classical” music and to enable them to see the major works of the repertoire in a different light. Sharing music with audiences means highlighting contemporary composers along with those of the past. David Grimal and Les Dissonances invite audiences to take part in the adventure of music, and at the same time they give music back its universality. Les Dissonances is subsidised by the French Ministry of Culture and Communication.